"The Second Edition to Cockscomb Basin Wildlife Sanctuary is way over due. The First Edition went out of print in 2002. Each year I get requests from professors for permission to copy the book for their students. In 2004 there was an attempt to produce a Second Edition. The text was updated and photos set aside to be included. But we never found the money for a conventional print run in full colour, so the book was never finished. Now that we are using on-demand technology, there is no need to accumulate the funds to print 2,000 copies at the start. "The First Edition was so popular that we did not want to make many changes except to update the information. The biggest change in the Second Edition is the inclusion of full colour photographs. In the intervening years there has been a great expansion of research in the Sanctuary, especially following up the original jaguar research and the reintroduction of black howler monkeys. Information gleaned from these many research projects is included with the species descriptions in the various chapters on vegetation, jaguars, other cats, black howler monkeys, other mammals, birds, reptiles and amphibians, and insects. "The BAS Environmental Education staff uses CBWS as a Nature School and has provided new material for teachers to motivate their students to appreciate and learn about the environment. "The production of the Second Edition has added a whole new set of volunteer authors and illustrators who have worked in the CBWS in the twenty years since we launched the first edition, and have become just as enchanted with the Basin." "The Cockscomb Basin Wildlife Sanctuary is a magical place where the wonders and diversity of nature are accessible to both the casual and the serious visitor. The serenity and tranquility of the Basin offer a welcome haven from the hustle and bustle of the modern world. A visit to the Basin is invigorating to the human spirit, and engenders a sense of harmony with nature. "Cockscomb Basin Wildlife Sanctuary: Its History, Flora and Fauna for Visitors, Teachers and Scientists is the joint, volunteer effort of many people, authors, photographers, artists, and others. Those of us who have spent time in this wonderful place have become enchanted by it and we would like to share the magic with others, Belizean visitors, the visitors who come from other countries to explore Belize, teachers who bring groups of students, and scientists who long to uncover the secrets of the forest. Thus, this book is intended to be a guidebook for the general visitor and a reference book for teachers and scientists. It is a compromise between a complete scientific treatise and a general guidebook. It is our hope that these detailed descriptions will be of interest to the general visitor and valuable both for environmental education and as a starting point for future research. 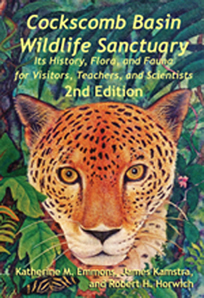 "The contributors to this book include local Mayans who comprise the Sanctuary staff, other Belize Audubon Society staff and volunteers, Belizean scientists working in the Cockscomb Basin, and scientists from abroad who have worked in the Cockscomb. You can read about each of the contributors in the section entitled "About the Contributors." "Most chapters have multiple authors. Where the text was merged, all authors have been indicated at the beginning of the chapter. Where separate sections were written by one person, the authors are indicated on the individual sections. Illustrators and authors are identified in the Contributor Index. "The book is divided into three parts. Part I includes the history and descriptions of the flora and fauna of the Cockscomb Basin Wildlife Sanctuary (CBWS). Here you can read the history of Maya Center, the nearby Mayan village, and how the CBWS came to be established. You will find descriptions of many of the animals and plants that inhabit the Cockscomb Basin, including a detailed report of the successful reintroduction of black howler monkeys into the Cockscomb Basin. 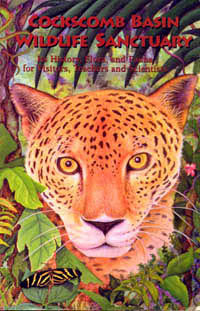 Checklists of mammals, amphibians, reptiles, and birds appear in the back of the book. "Part II is a guide for teachers bringing students to the CBWS, providing practical advice on how to make your visit enjoyable and educational at the same time, along with many ideas for activities. A glossary of biological and conservation concepts, along with the detailed information in Part I, provide a ready reference for anyone interested in environmental education. "Part III includes practical information for the visitor. It gives directions to the Sanctuary, details on how to make reservations, and describes the services available. Trail guides with maps and a guide to the identification of tracks are included to help you enjoy your visit. "A Quick Reference with a different logo for each chapter is shown on the right edge of the page. The Quick Reference Index is on the first page and inside the back cover. Since Part II has a black strip, the three parts are visible from the outside edge of the book.